A 28-square-kilometer island off the northwest coast of peninsular Malaysia, Penang seems the perfect mix of East and West. On the one hand it is home to many Chinese immigrants, yet on the other it is awash in colonial architecture. The hotel Penang scene is one equally welcoming to the high tech crowd that makes up the “Silicon Valley” of Malaysia, as it is to visitors who lose themselves in a land of dense jungles, small fishing villages, or the city center of Georgetown, which is a UNESCO World Heritage Site. 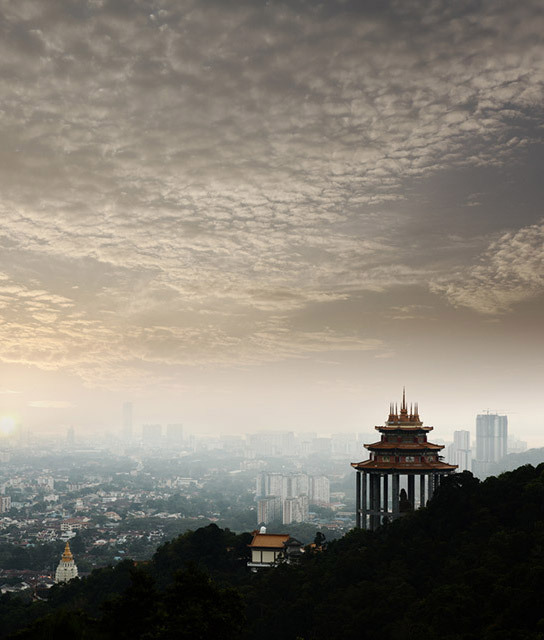 Located in the Straits of Malacca, Penang is also home to the Kek Lok Si Temple (or “Temple of Supreme Bliss”), which is said to be the largest Buddhist temple in Southeast Asia—more than one hotel in Penang is filled with visitors who have come for this site alone. Below find a list of our selection of boutique and luxury properties in Penang. A 100-year-old colonial mansion is the basis for Macalister Mansion, a quirky yet sophisticated lifestyle-oriented residence where visitors can experience Penang’s rich heritage – without even leaving the building.